Look out for our latest special offers, which include our range of mobility scooters, manual / power wheelchairs and our range of aides to living products. These products can be purchased from our network of Dealers across the U.K who will be able to offer professional advice and assistance, which will include a full product assessment. This will give peace of mind when choosing the Roma product for you. The origins of Roma Medical date back to 1970 when Mr Gordon Johnson and Mr Harry Matthews started a company called The Easi-Glide Wheelchair Company in Cardiff, South Wales. This company traded successfully for six years until they were approached with an offer from Invacare to buy the business. Mr Johnson and Mr Matthews accepted the offer and the two entrepreneurs spent the next two years working for the Invacare Group. In 1978, Mr Johnson and Mr Matthews started a new company, Roma Engineering. The name was derived from the first two letters of their wives names, RO from Rose and MA from Margaret. Contrary to many beliefs there is no link to the historical Italian city. 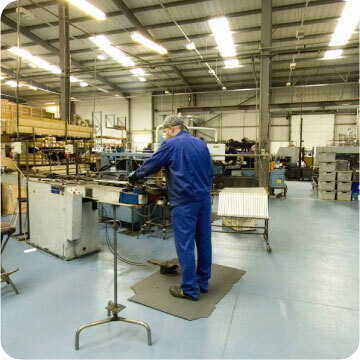 Roma Engineering was established on the Llandow Business Park, South Glamorgan where it manufactured rehabilitation equipment and other tubular products for the NHS. Business continued to grow and Mr Johnson, who by this time was the sole owner of the company, decided that Roma Medical Aids would be a more appropriate name for a company supplying medical equipment, and so the name was changed and the company was incorporated in December 1984. 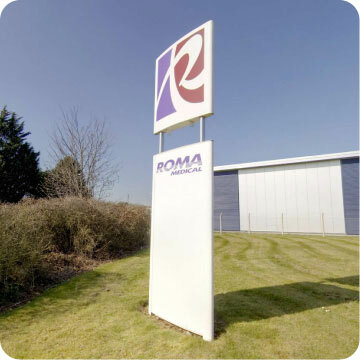 Whilst continuing to rent premises, in 1992 Roma expanded into a new 10,000 Sq Ft warehouse and offices on the Vale Business Park, South Glamorgan, which was officially opened by Mr John Redwood MP, the then Secretary of State for Wales. An additional 6,500 Sq Ft of warehouse space was added to this site in mid 2001. In late 1998, a new consortium of individuals with extensive industry experience approached Mr Johnson. By this time Mr Johnson’s daughter and son-in-law, who were also shareholders, were employed in the running of the business. It was felt by the family that the time was not right to sell, but the door was left open for possible talks sometime in the future. It was two years later, in September 2000 that the consortium made contact with the Johnson family again with a view to purchasing Roma Medical. By this time Mr Johnson had enjoyed a long and successful business career and was looking to take a less active role and his daughter and son-in-law, who were keen dog breeders, had an opportunity to buy and run their own boarding kennels. The timing was right and by late November 2000 an agreement was made with the family and the legal process began. Invamed was formed by the three owner/directors Simon Dalton, John Pitt and Harmar Roberts. Each had gained extensive market experience having worked in the mobility industry for varying lengths of time. 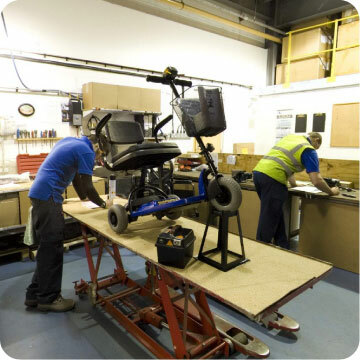 Began his working career with Zimmer in Bridgend who were then bought by Carters who in turn were bought by Invacare. Harmar spent 22 years there until moving to Days Medical in 1986 where he ran the sales before moving into the powered products. Harmar left Days Medical in December 2000 in advance of the purchase of Roma Medical. Began working at Days Medical after his college studies initially working in the packing department and eventually gaining the position of Director of Manufacturing. John was instrumental in many of the new developments including the patient hoists and the Vernachair to name a few. John also left Days in December 2000 in advance of the purchase of Roma Medical. After working in the bank for several years, Simon joined the family business in 1990 where he gained experience in many aspects of the company from sales, purchasing, marketing eventually becoming the Export Sales Manager. Simon left his position in November 2000 to assist with the extensive work required to buy Roma Medical. A strong bond was built between the three partners during their time together and it was 5 years after Days Medical was sold to an Irish investment company that they departed to establish a business of their own. It is testament that that bond remains as strong today. With new owners came new ideas and new goals. There was a huge emphasis on building the existing manufacturing capabilities. The projected growth would not come from this segment alone, so new lines were added to the range which included manual wheelchairs, rollators followed by mobility scooters and electric wheelchairs. It soon became evident that with the increased product range and the addition of new products, Llandow was not going to be a long term home. For three years Roma continued to grow and space was at a premium. New warehouses were taken on short term leases but this was not ideal as there was stock spread throughout the estate in numerous warehouses. In March 2004 the company moved to purpose built premises, at its present location on the Bridgend Industrial Estate where a long-term lease agreement is in place. Prior to moving into the 47,000 Sq Ft building the company installed a 17,000 Sq Ft mezzanine floor to increase the floor space to 64,000 Sq Ft. In April 2005 the company purchased a further property of 18,000 Sq Ft locally as an overspill warehouse but again as the company continued to grow an additional 24,000 Sq Ft was leased on a rolling contract giving the company a total of 109,000 Sq Ft of office and warehouse space at its disposal. Take a Virtual Tour of Roma's manufacturing and distribution facility in Bridgend. The tour offers a full 360 degree simulation of the entire establishment (including a number of locations that are generally off-limits to the public, such as manufacturing, assembly, loading bay and the sales office). Take the tour Now! Roma Medical has long been known for manufacturing and supplying an extensive range of bathing, showering, toileting and homecare aids and appliances. This was the main attraction to the new owners and with the increased experience available, the team headed by John, set about developing and modifying the range. By 2003, the company had developed and launched 37 new manufactured products and improved or redesigned a further 48. It has been the directors commitment to their loyal work force that they intend to continue with UK manufacturing at a time when most others have already moved manufacturing overseas. The installation of the plastic coating plant in 2008 was a major step in the continuation of manufacturing in Bridgend. With the loss of a local sub-contractor who carried out this process, a decision had to be made quickly. Customers would not wait for deliveries and the only alternative was for Roma to purchase their own plant and use another sub-contractor based in the Midlands in the short term until the delivery and installation of their own equipment. Since installation, manufacturing sales have grown, costs have been cut, delivery times have dropped and the quality of the end product has improved. In addition, the company has developed an Anti-Microbial coating called RomaPlas, which is an effective protection against hospital-acquired infections such as MRSA, E-Coli, Salmonella, and Listeria. This was a project that was first looked at in 2001. It was then looked at again and again over several years but each time financial constraints and the high cost of tooling proved too much and each time it was filed for another day. 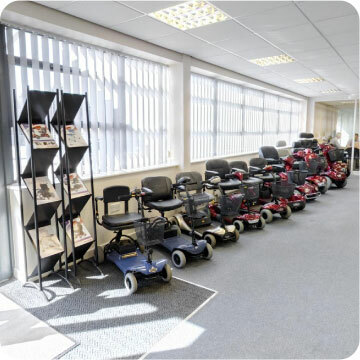 In July 2008, the company was approached by a leading hospital in the NHS to help them in their endeavours to find an alternative to the commode chairs they currently used on their wards. This brought out the file yet again and on this occasion, the directors agreed that they would go ahead with this new product and after 18 months of hard work and a massive investment in tooling and plastic moulds, the Romachair was ready for market. With the seamless design and incorporating the RomaPlas coating the Romachair is truly the leading commode chair for hospital ward use. Roma Medical first dipped its toes in the Power market with the introduction of a range of 4 electric scooters. Under the expert guidance of Harmar, this new range was developed for Roma and marketed under the Invamed brand name. These proved to be a success and greatly helped the directors to double the company’s turnover in their first 10 months as new owners. In early 2002, the directors were approached by another scooter manufacturer and were offered the entire Shoprider range of scooters and power chairs. This was an opportunity that the director’s felt was far too good to miss, and after arranging the finance with their bank, the directors having taken huge personal financial risks, agreed with the manufacturer and switched scooter suppliers. Scooter sales soared and within two years the Shoprider brand was the Number One brand in the UK with annual sales of more than 25,000 units. The success was the boost the company needed and allowed complimentary products to be sold alongside the scooters. In effect, Roma was becoming a one-stop shop for the market. The company continues to develop and improve the entire power range, working closely with their manufacturers, providing new ideas and suggestions. Shoprider products still form an important part of the Roma power range but the development of an own brand Roma range offers their customers a greater choice. Roma continues to expand its sales and product range. In addition to the UK market, Roma products are distributed in 25 countries. Employee levels in 2001 were 32 and the company now employs 70, with longevity being a key factor in the company’s growth. There are even a few with the company dating back to the Johnson family time. The launch of the new web site is a major milestone for Roma and now having complete control of the site in-house will enable you, our most valued customers, to be able to access the most up to date information and news from Roma Medical. We hope you enjoy your visit and welcome your comments and suggestion.